SMARTFIX SNOW MELTER – MELT IT, DON’T HAUL IT ! The Smartfix Snow Melter is the beginning of a revolution in the Snow Removal process. This commercial Snow Melting system eliminates accumulated snow, even in the toughest conditions. Using the very latest advances in heat exchanger technology, this product presents an economically viable solution to the expensive and environmentally unfriendly process of physically hauling and relocation of snow, for Snow Contractors, Facilities/Property Managers, Municipalities and Airport Operations alike. The typical snow removal process requires areas for snow piles or hauling snow offsite. This practice has become less attractive due to variable factors such as rising fuel costs, scarcity of dump sites, increasing labor costs, loss of parking, as well as security, safety and environmental issues. If you are currently hauling snow, we suggest that you take a look at your previous winter seasons and compare your snow removal costs with the operating cost of a Snow Melter. The Snow Melter provides the ability to melt snow onsite and puts you at the forefront of the industry and allows you to diversify your business. 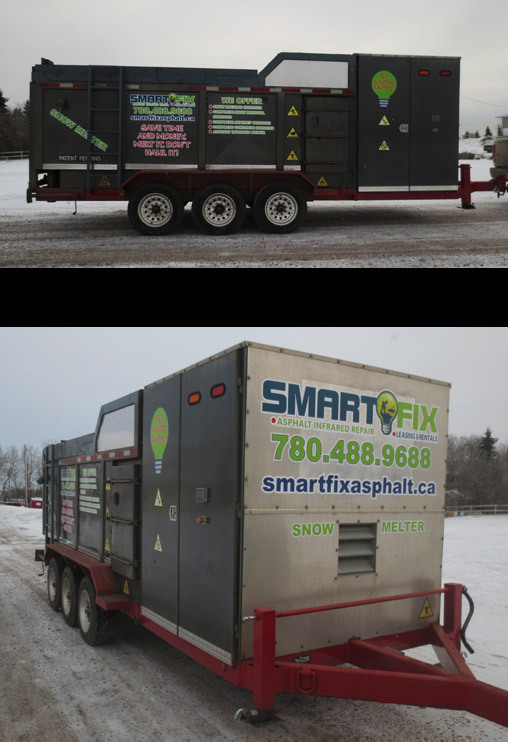 The Smartfix Snow Melter, when compared to hauling, can provide a 20% or more, reduction in costs. Contact us today and learn how our Snow Melter offers you better tools for managing your Snow Removal Process!